Why a Cookie Decorating Party? Why not? Iced cookies aren’t my personal favourite to eat (I’d take chocolate chip any day) but some occasions call for icing cookies and the process is fun. Children love to be creative and messy all at the same time. That is why we decorate cookies. The fact that you can eat your work when it’s all done is simply an added bonus. What about a set of autumn themed cookie cutters or different sizes of pumpkins with teal icing for the #TealPumpkin movement? I’ve had cookie parties where we decorated Ninjabread men but I have not yet made tiny pixel-like square cookies decorated in all sorts of colours to make Super Mario. I would love to be at that party. The ideas are endless so let cookie cutters be your inspiration. Get kids involved in the idea from day one. Be sure the planning and baking cookies is part of the project and teach them they can think ahead. look forward to something and then be rewarded with the accomplishment. Last year leading up to Canada Day I wondered if I could make a flag out of cookies? A big, colourful flag like the stylized Canada 150 flag. Of course I knew I could but the planning never happened. The 150th birthday came and went but this idea seemed to hang around. Fortunately Canada announced we were to celebrate the 150th birthday all year long so I turned the Canada 150 Cookie Flag idea into a fun project. I hosted a Cookie Decorating Party. This year I have had the pleasure of meeting several young people as a volunteer with the local chapter of the Canadian Celiac Association. I started a Celiac Kids Meetup group and have gotten to know some of the kids who have attended the meetups. Children with restricted diets (just like adults) don’t have many opportunities to attend a party where all the food is safe to eat. This got me thinking about a cookie decorating party. 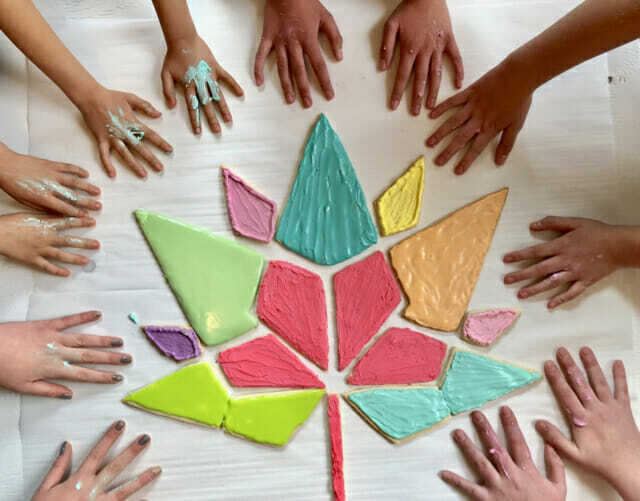 A party where we would ice cookies then assemble them into the Canada 150 flag. With Canada Day just around the corner it was the perfect idea. Kids love cookies and so do I. The week before the party I baked two batches of my sugar cookies into the different kite shapes of the flag. Allowing for breakage I made two of each kite shape plus extra for more decorating. With six kids we iced and assembled sugar cookies into the Canada 150 flag, took pictures and were all done in just two hours. They ate what they wanted to and took the rest home. Royal icing is the kind of icing that is very firm when it hardens so is the best choice for decorating cookies and making gingerbread houses. It is made with icing sugar and either egg whites or meringue powder. I wrote more about that in this icing post ROYAL ICING if you are interested. Making the icing is easy. Making the exact colour you want is a skill I have not mastered. The Canada 150 flag is made of 13 pieces representing Canada’s 13 provinces and territories. It was designed with nine different colours so that represented an icing challenge for me. I decided that my flag was not going to be perfect, and it didn’t need to be perfect. Rather than magazine perfect it would look perfectly made by humans. A Cookie Decorating Party is significantly easier than making a gingerbread house and it can be done at any time of year. With only one or two shapes of cookies and three or four icing colours you can have a lot of fun. For a more adventurous crowd you can have several different cookie shapes with a theme, custom designed or using cookie cutters, and as many icing colours as you like. For this party I had to make the cookie shapes. This was a project in itself but I wanted to do it. I printed a flag template and photocopied it 300% to come up with a size I was happy with. Then I cut out the pieces using paper (plain white first then coloured paper as requested by my photographer). I laid them out onto a make shift 3-foot by 3-foot foam core board. Satisfied with the size and the look I then cut out the pieces onto card stock. Not cardboard which is too difficult to cut, just card stock. The cover of a notebook, old file folders or the back page of a pad of writing paper would all be appropriate. This idea would be significantly easier using cookies made from cookie cutters you already have or new ones you buy. No matter what you decide if you are inspired by this idea I encourage you to go for it. Enlist the help of kids or parents and make your party as simple or complex as you like. Parties take time to plan so being in the right frame of mind is important. Tasks can be divided and shared. They can be completed over several days or even weeks. Here is one way to breakdown the tasks for sharing. For a custom design choose a picture with pieces that can easily be cut with a knife. Decide on the final size adjusting the picture by hand or using a photocopier, until you have the size you want. Cut out the pieces on paper first to ensure the pattern works. Then cut them out onto card stock. For a non-custom party simply choose the cookie cutters you want and decide how many you will need. Choose a tray, board or foam core to display your finished project and take photos. Cover it with paper or paint if needed. Make enough cookie dough for the project. Sugar cookies or gingerbread is ideal. Roll, cut and bake the cookies. Make extra for practise decorating, breakage and for more decorating after the project is complete. Freeze the cookies if they are made more than a few days in advance. Make royal icing the day before or the day of the party. Throw a Cookie Decorating Party. Show off your cookie project, take pictures and share widely. Icing cookies is creative. For this Cookie Decorating Party we had a project to do but once the flag cookies were iced and set aside to dry the real creativity happened. With the extra cookies kids used multiple colours, swirled icing like watercolours and created their own unique designs. Remember, the reason we decorate cookies is to have fun. You set the tone in your kitchen and let the creativity begin. If you want to plan a Cookie Decorating Party or if you host one I’d love to hear about it in the comments below. If you are a podcast listener you can listen to my interview on A Canadian Celiac Podcast all about my post title Tips For Making Gluten Free Cookies, listen here A Canadian Celiac Podcast episode 43.